Rome was not built in one day. It is also evident that It takes hard work, commitment, great foresight and oneness for an organization, company, association or federation to stand firm and become extra productive. Isaiah Kiplagat, the long time serving chairman of Athletics Kenya, the country’s athletics governing body can confidently attest to this. He joined the athletics association back in 1975 as the vice chairman during the reign of the then chairman Charles Mukora and in 1976 he was elected as the secretary general of the International Association of Athletics Federation (IAAF) consequently joining the technical committee which he was part of until 1987. With the international world recognizing the dominance of Kenyans in athletics, the IAAF in 1987 opted to create a regional development centre that would be used to train coaches and athletes and Nairobi was selected to play home of the 1st ever development centre in the world and Kiplagat was appointed president and regional developer John Velzain as his vice. Velzain is the current president of the project. But it was in 1992 when Kiplagat took up the chairmanship of the association picking up the button from his predecessor Paul Boit. But not until when he took up the hot seat did he actually realize the many stones he had to turn in order to make AK what it is today. “Back then we neither had offices, money nor equipment to operate the association activities yet we had already gained recognition across the globe and quick action needed to be taken urgently,” recalls the former prison officer. Within the 1st year of leadership, AK managed to gather a surplus of 5 million Kenya shillings, money collected from their savings and sponsorships received and slowly the association started to take shape. It was during the early times of his tenure that the then International Amateur Athletics federation (IAAF) slowly transformed into the International Athletics Association Federation (IAAF) forcing every other amateur associations across the world registered by IAAF governing body to change to fully recognized associations. 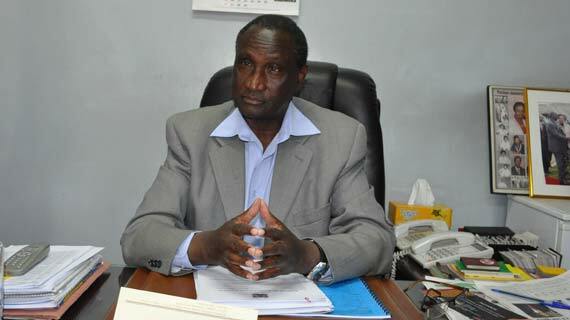 Nevertheless, Kiplagat- a father of 5 acknowledges that the association’s success hasn’t not been a one man’s show. A very strong team of General Jackson Tuwei, the senior vice chairman, David Okeyo, the secretary general, Joseph Kinyua, the national Treasurer, Peter Angwenyi the Public relations officer, Mary Chege, the women representative as well as their assistants have over the years organized and supervised the national athletics activities that take place within and without the Kenyan borders with dedication and strong purpose for success of Kenya’s athletics. With the help of strong youth programs spearheaded by AK’s senior vice chairman General Jackson Tuwei, Athletics Kenya has managed to nurture young and upcoming athletes throughout the years, a move that has enhanced good performances from both the junior and senior athletes’ categories. “General Tuwei’s commitment to the youth development program has also added to the success of the association due to the fact that we can monitor the growth of the athletes from their junior days to their senior days and assessing their growth before they become world conquerors,” adds Kiplagat. Kenyans can strongly attest to the great performance of our athletes that dates back to 1968 when Kenya bagged its first Olympic medals to the most recent 2011 outing in Daegu, South Korea where Kenya gathered a total of 17 medals (7gold, 6 silver, 4 bronze) the highest medal tally ever registered in the world athletics championships competition. The extremely good and consistent performance showcased by the association has led to AK bagging the federation/association of the year award in the SOYA awards ceremony 3 consecutive years since 2009. It has taken hard work, commitment and cohesiveness among the association’s members to build AK to what it is today, I owe it to them, concludes Kiplagat. Born and bought up in a humble background in Nandi, Rift Valley. Schooled in the 50s after his mother’s intervention to have him go through school. After having the rare chance to join high school, he went through a police training program and was soon employed as a cadet officer of the Kenya prison back in 1965. He was later promoted and authorized to open and spearhead a new police post in Naivasha. He later left for the UK in 1969 to further his education on management studies. On his return, he earned a job as a Nairobi council worker in 1975 before joining Athletic Kenya and appointed as vice chairman. 1992 elected the new chairman of Athletics Kenya. Worked as the managing director of Post Bank from 1988-2002 when he retired.